Vegetable lasagna with carasau bread. Wash, dry and chop the zucchini, the eggplant and the peppers. Then you need to stir them with a little bit oil oil until it is soft. After that you need to add salt and pepper. We lightly wet the slices of bread. We can put them under the tap carefully as they can break easily. We put a slice of bread on the greased baking tray or lined with baking paper. 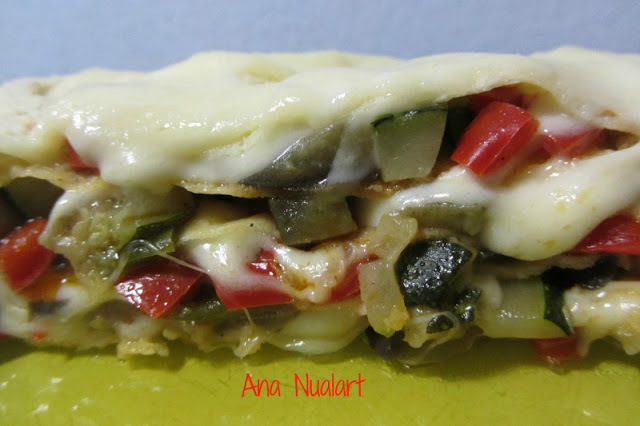 We cover it with a layer of chopped vegetables and Mozzarella, we keep making layers and we finish with a slice of bread and Mozzarella. Bake in the oven preheated to 180 º until the Mozzarella is well melted. We serve it immediately and then we only need to enjoy lunch or dinner! !